We went to watch The Cat In The Hat play at the DBS Arts Center last week with fellow SMBs and their kids. Baby girl was super excited when I told her that mummy was going to bring her somewhere special. This is the first time she has been to a play and she really took in the atmosphere as well as the many, many children that filled the theatre! We sat pretty far at the back but we didn't mind as we could still see all the action rather clearly. 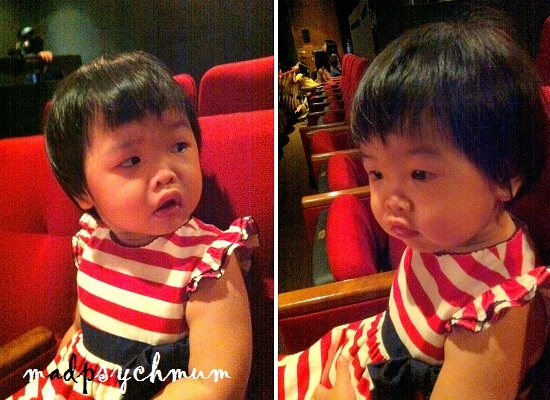 Plus, the theatre provided us with plastic booster seats, which baby girl insisted on sitting by herself. "I sit on booster seat myself mummy!" When the play began she was mostly engaged in it because 1) she has been watching The Cat in the Hat on TV so she knows what it is and 2) it was pretty easy to understand what's happening. We've been trying to plan a playdate with Ally (who is just 2 days younger than baby girl!) since one year ago and it has finally happened. After a while though, baby girl became more interested in irritating joining in the older boys in their activities. "I'm here but I'm not here..."